Mixed media: plexi, inkjet transparency, found objects, light boxes. 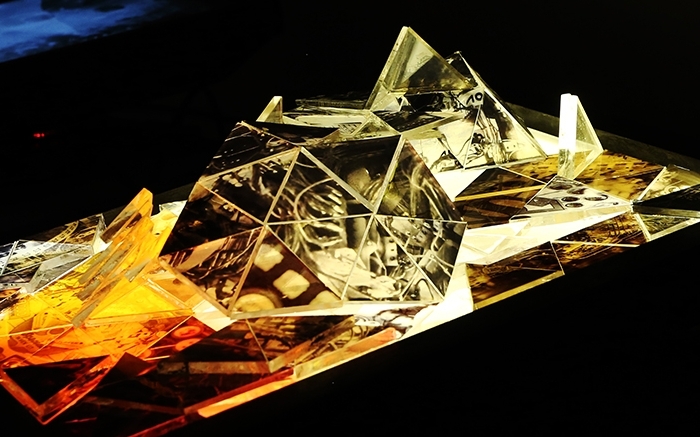 Mission Terrain is an illuminated mixed media sculpture that deconstructs the landscapes and history of the American pinball machine. Digital collages (Part 1 and Part 3) are created from an extensive visual archive of machines spanning 70 years. Physical remnants of 1940s machines are also included. The piece has interactive, moveable elements and was used as a stop-motion prop for the film Aquacade.